Happy Thanksgiving weekend! 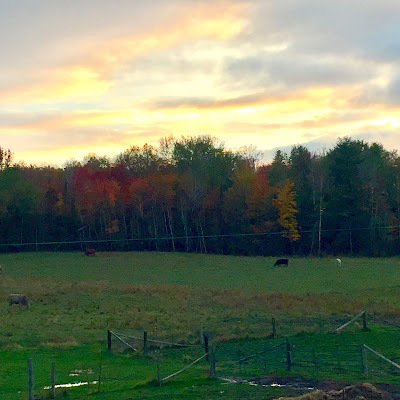 This year, we decided to go back to the farm for the holiday. The trees are so beautiful up North this time of year and it makes for a very scenic drive. The colours aren't as consistent because Thanksgiving is so early this year. I bet they'll be even more breathtaking in a week or so. I snapped this shot of the field right at sunset. It had rained during the day and the sky was so beautiful at this very moment I just had to capture it! We will be enjoying a low-key turkey dinner with my parents tonight because none of the other siblings could make it. They were all up at the farm recently, so really, I'm the one who missed out on seeing everyone! Good thing I have the wedding to look forward to! 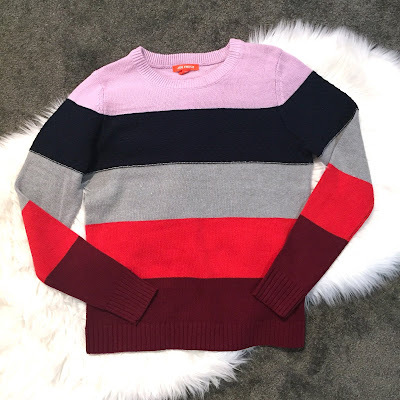 How amazing are the colours in this sweater? It's what my colour-blocking dreams are made of! 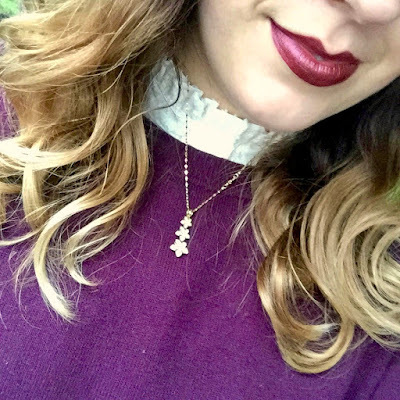 Burgundy, navy and grey are my go-tos during the cooler months, but the pops of red and lilac are giving me all the fashion feels! The fact that it is striped is just bonus to me. What I really love is that the pattern makes it stand out from other, solid-coloured sweaters. I'm always looking for ways to dress up my sweaters and change them up, but this one is a game-changer! Wear it on its own for a simple, easy look that is put together and interesting. Or, layer it with a variety of different shirts for added interest and whimsy! It's fun, colourful and everything a girl could want in a sweater. I can't wait to wear it! This one is a Joe Fresh but is unfortunately sold out. I've linked similar options in the widget below! I purchased these prints about a year ago, when we first moved back into the house. I knew I'd have a big empty wall space between my wall-units and above my sewing machine desk that would be the perfect canvas to create a little gallery. I've always loved the prints at Chapters, but never had the wall space to make a gallery. Well, now I do! I recently went to Michaels to get frames for them and finally got around to hanging them up! Seeing as the basement is my creative space/office, I chose a fashion theme for my gallery. What do you think? 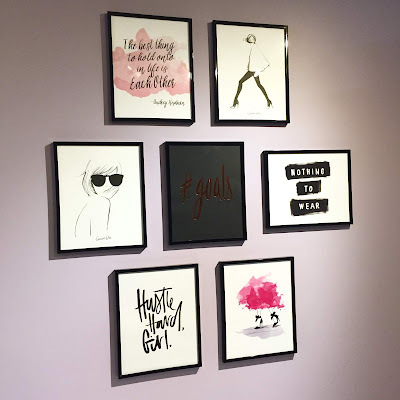 Would you set up a gallery wall in your office space? So, those who know me know that cooking is not my forte. It's not from lack of trying to teach me on my mom's part. I simply grew up with brothers who loved to cook so, when mom wasn't around, I didn't have to worry about feeding myself. Then, I started living my partner who's an avid cook. He loved to cook and I love to eat, it's a match made in heaven! All kidding aside, I'm not completely useless in the kitchen, I did pick up on a few things. All this to say that the other day we got a bunch of carrots (they were on sale). We got way too many carrots... We blanched and froze half, but were stuck with the other half. I decided to make my mom's Golden Carrot Soup. I had made it successfully in the past, so felt confident I could pull it off again. My mission was a success! 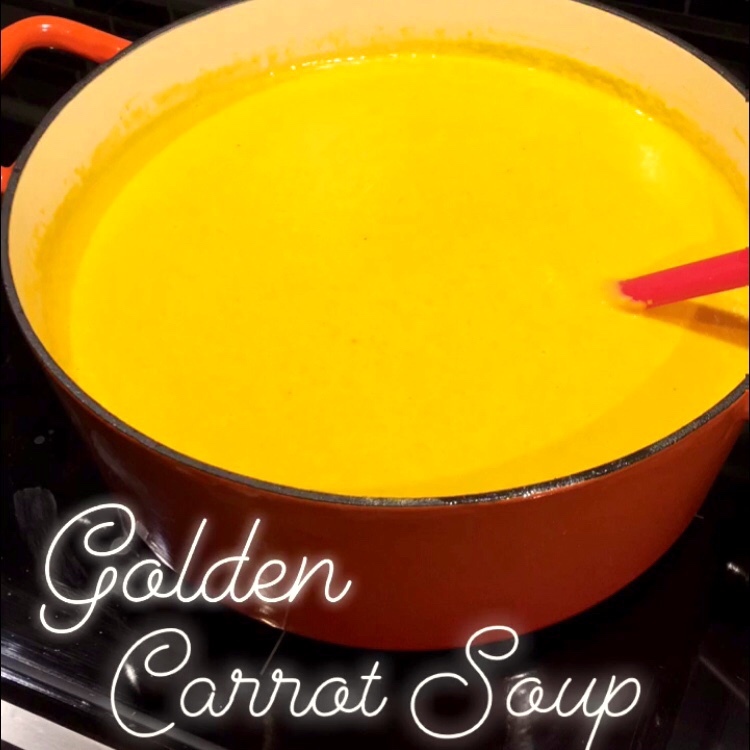 I made a quadruple recipe (and still had four carrots left over!) It's the perfect thing to freeze and take out on a cold fall day. Soup season is upon us and I'm off to a great start! The biggest reason for going up to the farm was for our engagement photo shoot! We were really looking forward to it and I was lucky enough to have a high-school friend photograph us. I can't wait to see the pictures! We had planned on doing the shoot at the exact location we got engaged because it's a place that means a lot to me and now us. It just seemed to be the most fitting setting. I'll be going into depth in a future engagement post and spilling all the details, but in the meantime I leave you with this sneak peek of my look!